Vivien is from a lost world named Skalla, but apparently there are certain techniques that are common across the universe, and not just ornithopters – her Invocation reminds me a lot of Summoning Trap from Zendikar. 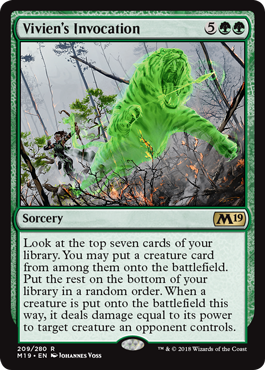 In this case, you’ll be committing a lot of mana to an effect that doesn’t guarantee you a creature in itself, and constrains your deck to a construction involving a certain percentage of creatures, and presumably mostly larger ones and Rampant Growth effects at best (Birds of Paradise is as good as whiffing with this card, and that’s one of my favorite creatures!). When it does work, though, you’ll end up in a dominating position on the table. Just don’t use it with Emrakul, the Aeons Torn. Nobody enjoys that and neither will you (it’s too easy! ).